Exc. 1, CAJC - started JCH CZ!!! Very promising 1/3, BIS 2 baby out of 30 puppies!!!! In 2018, were born 44 ooffspring after our Tyler. The first was litter "B" Neowille (10 puppies), which were born in January. The second was litter "B" Ilfirino Aire (9 puppies), which were born in March. Third was the litter "C" od Rybníka Podhoráku (7 puppies), which were also born in March. The fourth litter was our long-planned first litter "A" in our kennel (9 puppies), which were born in April. The fifth and last litter of this year was the "E" Chesphoni litter in the Netherlands (9 puppies), which were born in September. I am very pleased that breeders kept one female from the litter after our Tyler and they want to use them for breeding in future (Kennel Chesphoni, Ilfirino Aire and Neowille). In the spring, Marek successfully obtained a firearms license and then entered to Hunting course to get his hunting licence. He passed hunting practice this year in local hunting club and next year in sping will have tests from hunting theory. If everything goes well, we will have a new hunter at our home. This year we had our first breeding premiere, we have 2 litters "A". In April were born the litter "A" of the Weimaraners, the mother is our "ANY" and the father is our "TYLER", were born 9 puppies - 5 males and 4 females, 7 of them live in the Czech Republic, 1 in Estonia and 1 in Slovakia. In September were born litter "A" of labrador retrievers, mother is our "ASHLEE" and father is imported dog from Germany to Slovakia - Jaguar Jackpot v. d. Weeward. In this litter were born 7 puppies - 4 females and 3 males, 6 of them live in the Czech Republic and 1 in Slovakia. "TYLER" Caramel Love de Donawitz - scored at dog shows and again showed that he still does not belong to the old iron. In the honour class, he won the first and second place in the final competitions as the best honors class at the national exhibition in Brno and Bratislava. Since September he is already in the veterans class and has begun Czech and Slovak veteran champion! "ANY" Any od Ptačího dolu - before the puppies started the Grand Champion of the Czech Republic and the Champion of Slovakia. In the summer, after the puppies she was presented in the winners class at the national and club show, where she definitely did not lose. At NDS she received Exc.2, res. CAC of 5 females and at club show obtained Exc.3 from 6 females. "TRAVIS" Contact with Marvel Atagora - he started his show career in big style. He gained in puppy class the Slovakia Puppy Champion. He started Junior Championships of 3 countries - Czech Republic, Slovakia and Hungary. At the end of the year, he finished the Slovak and Hungarian Junior champions. In the junior class he gained 7x CAJC, 6x Junior BOB and 4x BOB - 3 of them from Hungary and 1x in the Czech Republic in competition of about 35 weimaraners, which is on such a young dog amazing success. The offspring of our Tyler also did great job this year, some of them successfully passed the hunting tests, from the tests of talent to the highest tests - versatile. 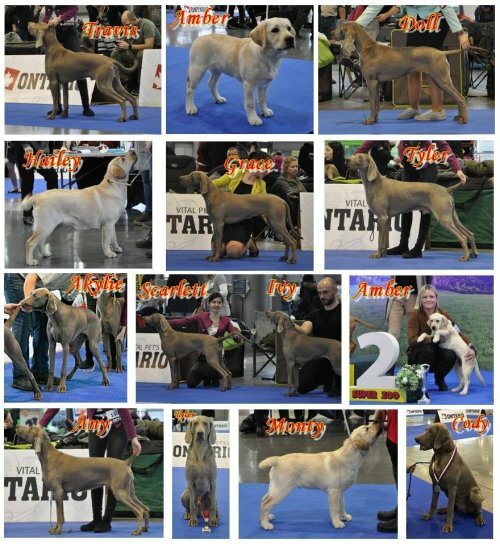 They did not hesitate at the dog shows aswell, where several of them managed to start or finish champions of beauty. Some also fulfil all breeding conditions and became breeding dogs. "SCARLETT" Amazing Huntress Emerald Marvel - we kept one girl from our first litter of weimaraners. She is a female with a red collar that caught us when she was born. She was the best puppy, the first in the milk bar, the most energetic puppy from whole litter. From the first moment we knew that this one must stay at home :). Scarlett participated in a total of 5 dog shows, of which 2x was very promising 1, 2x very promising 2 and 1x very promising 4 out of 10 females at club show which I consider to be a great success. "HAILEY" Silver Skydiver Best Impression - I assisted to my cousin Roman with the import of a labrador retriever female from Ukraine in the this fall. Hailey will be registered under my kennel, but she will live with Roman and Ashlee in Dolni Dunajovice. In Ukraine she graduated one show with a very promising 1, BOB puppy. In November she was with Roman in Nitra, where she got the mark Very Promising. 3. I was fascinated by her perfect pedigree, a nice exterior and a strong skeleton, her mother was imported from the renowned Mallorn's kennel in Finland, and her father was imported from Russian Yankee Goodwill kennel. In her pedigree, we find most of the American dog's stronger skeleton. I'm looking forward to working with her, it looks like she's going to be a true retriever, she likes water and retrievering. Next year we plan to train our youngsters. If everything goes well, we would also try some hunting tests. We will also show up on some dog shows and by the end of the year we will look some stud dogs for our girls :).